It never fails that each time I venture to the shoreline something new or new-to-me is sighted. In the first half of my life, birding is not a thing I ever thought would interest me. Although I've always been fascinated with them, their quirky habits and characteristics intriguing me from early on. I've even had caged domestic birds in the past. Photographing birds brings on a whole new element and dimension to curiosity. It isn't enough anymore to admire from a distance or take the time to observe and wonder at their beauty. Now I want to know their names, their habitat, their status in Florida. Out and about with my un-fancy equipment I pay attention. Then I do a little research to quench my thirst for knowledge. Time isn't always on my side and often I don't pursue with complete satisfaction. In any case, it is a hobby way down on the list of things that interest me so any information is more than I started with. A before-dawn drive down to Fort Desoto Beach one morning this week offered a few hours of abundant shoreline activity. 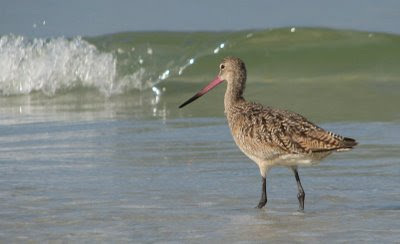 This lone Marbled Godwit foraging along with help from its adorable pink-based, upturned bill is an easy one to identify. They use it to probe deeply in the sand for crustaceans, mollusks and worms. 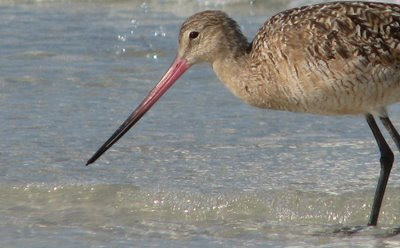 Godwits are common migrants that do not breed in Florida. They are typically here from August to April but can sometimes summer here. birds are a fascinating photo subject. i just love seeing the details once you upload the photograph and being able to study all the intricacies. 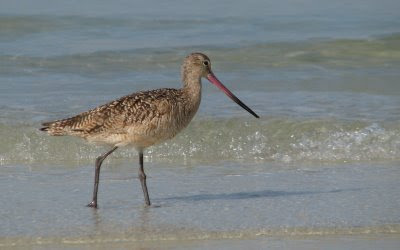 i don't remember seeing the marbled godwit as a child either. i love how all of nature is thrilling you and giving you so many different outlets...for me it is the same. i think we were just too busy before with children and life. Isn't it remarkable how the photograph really does capture some details we don't notice with our human eye until we can zoom in on the stillness! Too busy indeed with the everyday demands that kept us concentrated on the most important things at the time. It's very nice to have a little extra time to ourselves once in a while these days. A different season ... to revel in all God's creation. Very nice. A beautiful bird beautifully photographed. My hat is off to you for your knowledge of the shore birds.I love to photograph them,but unless Jon is with me,I have no clue what they are.He can rattle off their names. And don't you love Ft.DeSoto in the early hrs?Before the tourists get there? I agree with Marmee that we might have been too busy earleir on to appreciate the finer points of nature. I sat for the longest time enamored by this beautiful bird. Thanks. I'm working on retaining the information I read in my birding books. If not for them I'd be lost. :-) I hadn't been to Ft. DeSoto in SO many years I forgot how huge it was. Only one lone soul on the beach when I got there... it was glorious.